Far from civilisation, adventurers discover locations that bring adventure, treasure...or death. Marsh Locations is a set of four isolated locations that are ideal for marshland adventures. 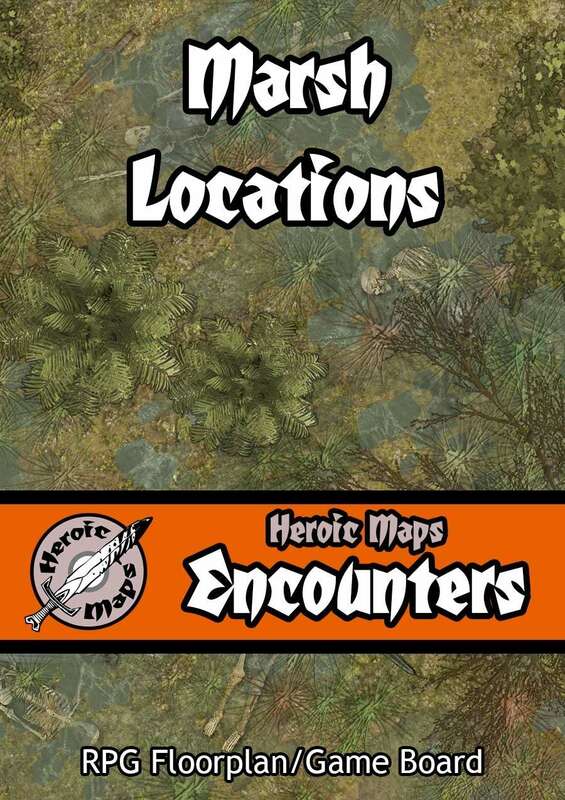 Marsh Locations is a printable battlemap compatible with any RPG/Dungeon-Crawl game. Use as a standalone gameboard, or combine with any same-scale tileset. 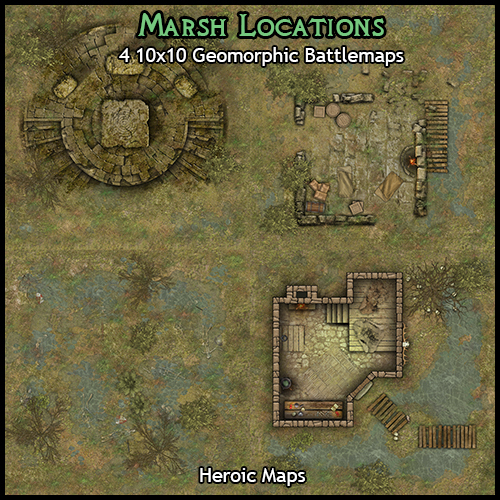 Marsh Locations is a geomorphic set, comprising 5 10x10 square battlemaps which can be arranged in multiple layouts. Each tile can be used on its own, or can be matched with tiles from our Marshland geomorphic set. The Witch's House - near a tree decorated with skulls, the House of the Witch is best avoided. Some say there is a secret pit beneath the house. The Ancient Battlefield - The site of a battle in years past, the skeletal remains of the fallen lay sunken in the mire. The Ancient Battlefield - seek a long lost weapon, resist the call of the voices of the dead, lay old ghosts to rest. Also included is a set of 300dpi full size jpgs, for poster printing or VTT, in both gridded and non-gridded versions. (n.b. gridless version only available as full jpeg). 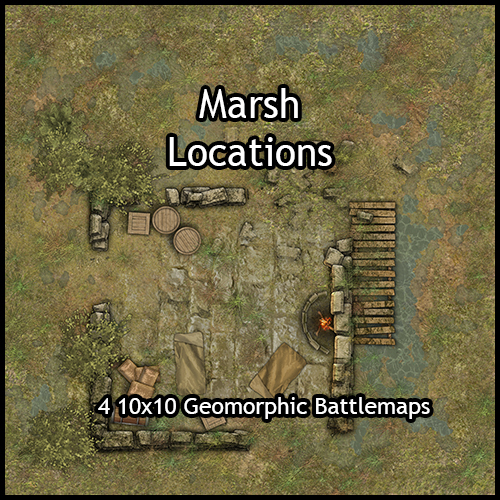 Marsh Locations- 4 battlemaps, each 10 x 10, and can be printed at 28mm and 25mm scale. Our game boards were originally designed to be used with Heroquest. That's why you'll notice we don't mark the doors or add furniture - you can put these wherever you want them, using you favourite system (paper or 3D). This will mean the board can be different every time you use it. You can download our free door pack here. 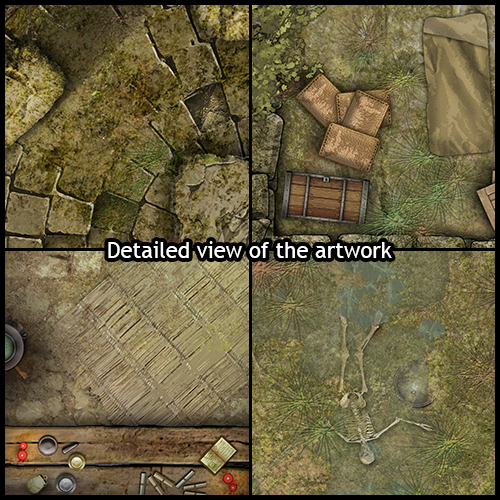 Have you tried these battlemaps yet?